I’ve been on Vancouver Island, British Columbia for over a week visiting my sisters Faye and Betty. We’ve had an awesome time so far touring the lower half of the Island. Last week, we rented a car and left for our adventure, stopping at Port Alberni in the middle of the Island mountain range, to watch my niece, singer/songwriter Brodie Dawson, sing at the first stop in her fall tour (watch her here on YouTube). We stayed at a lovely Bed and Breakfast accommodation called By The Quay simply because we drove by while looking for a decent place to stay for the night, and went to the door and asked Rose if she had room for us! She had the most comfortable mattress we’ve ever slept on! The next morning, we left for Tofino, the surf capital of Canada! The day was sunny and warm as we drove through rain forests, the Pacific Rim National Park, and walked the beach at Incinerator Rock, Long Beach watching several surfers ride the ‘high wave’. It was awesome! We walked around ‘the rock’ and ended up getting trapped by the incoming tide lol and had to climb the rock to avoid another soaker. We checked in to the Schooner Motel in Tofino which had a magnificent view of coastal mountains, a glacier, the Pacific ocean, and Clayoquat Sound (home of the 1993 largest non-violent civil disobedience protest in Canadian history which involved logging precious rain forests). Even though the motel beds were hard as a rock, we had a fun time: we sat outside in the evening, enjoying the scenery while watching the sun set and went on a ‘walk about’ around the town inhaling the incredible sites and sounds of this rain forest oasis. We left Tofino the next morning, driving back through the rain forests, including Cathedral Grove which is the home to a stand of old-growth Douglas fir trees, and made a pit stop in Coombs at Goats-on-the-Roof (where goats literally live on the grassed roof of the Old Country Market). Afterwards, we headed for Victoria, the capital of British Columbia, on the southern tip of Vancouver Island. 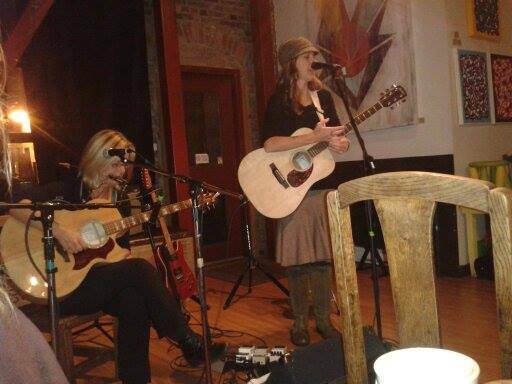 We attended Brodie’s Victoria show at the Solstice Cafe after enjoying a delicious supper made by Betty’s son Curtis. The next morning we toured around ‘Vic’ taking in the harbour while stopping in at garage sales and thrift stores. My sisters and I can’t help stopping in at second-hand stores whenever we can! Then we left via ferry for Salt Spring Island, the jewel of B.C.’s southern Gulf Islands. 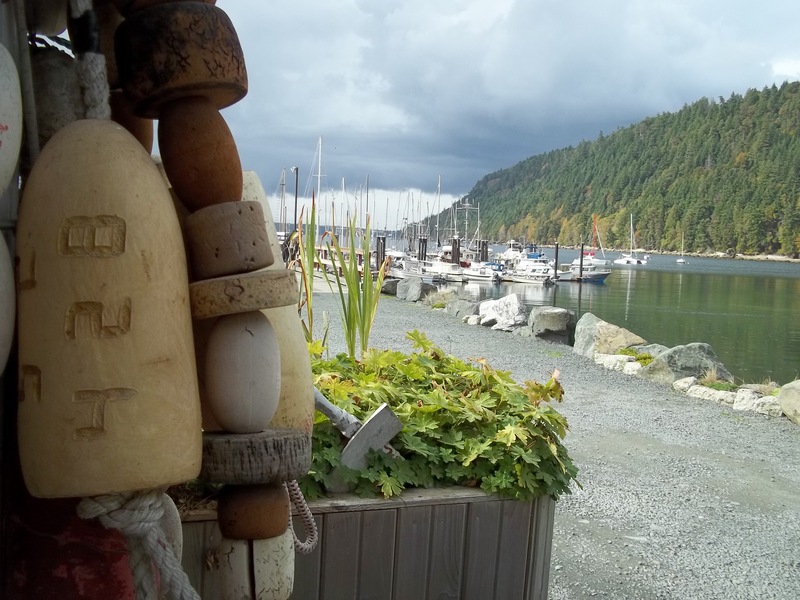 Salt Spring is a beautiful island where winding roads meander around mountains and valleys. We arrived in the main town of Ganges during a rainstorm so we ducked into the Embe Bakery to pick up some food to eat later. We decided to drive around the top half of the island and enjoyed beautiful vistas of nearby islands in the blue waters of the Strait of Georgia and mainland snow-capped coastal mountains in the distance. It was breathtaking! Then we paid a visit to our cousin whom we hadn’t seen in decades, who lives on this island. 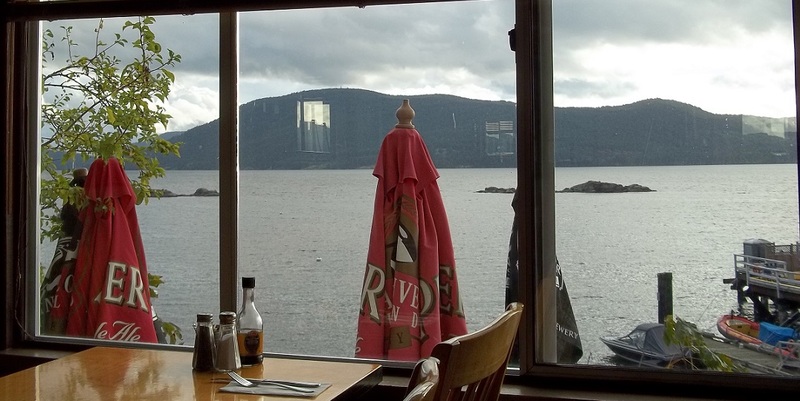 We enjoyed a delicious fresh fish ‘n chips supper at the Seaside Restaurant which sported the most beautiful view of Vancouver Island and the ocean. Unfortunately, our Bed & Breakfast accommodation was not up to par but, on the bright side, we met some nice people from San Diego and Britain. We left Salt Spring Island the next morning on the ferry to Crofton on Vancouver Island. As soon as we got off the ferry, my sister spotted a thrift store so we paid a visit and spent a leisurely hour hunting for bargains (50% off that day!) lol. We had a great time! Our mission for the day was to take another ferry to Gabriola Island to visit a friend of my sister Betty. On Gabriola, we ate lunch at Robert’s Place restaurant where I had the best seafood Chowder I’ve ever eaten. After driving from one end of the island to the other, we said our goodbyes to our friend and took the ferry back to Nanaimo on the ‘big island’. Many times I’ve visited my sister on Vancouver Island and we’ve never taken the ferry over to nearby Denman Island so this year we planned our first day trip there. 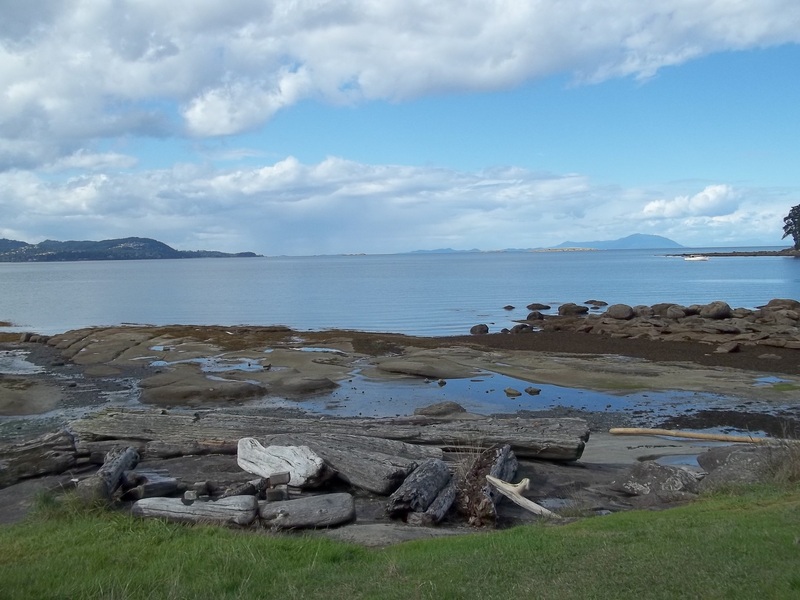 Hornby Island is another island beyond Denman which is only accessible via ferry from Denman Island. We took the two ferries and landed on Hornby Island where we drove through winding forested roads hugging the shore to Tribune Bay. We enjoyed a delicious lunch of Carrot-Ginger soup and a sandwich at Jan’s Cafe then walked to the beach to relax for a bit. Afterwards, we went to Ford Cove and walked along the wharf spying a few sea lions on a rock in the water. 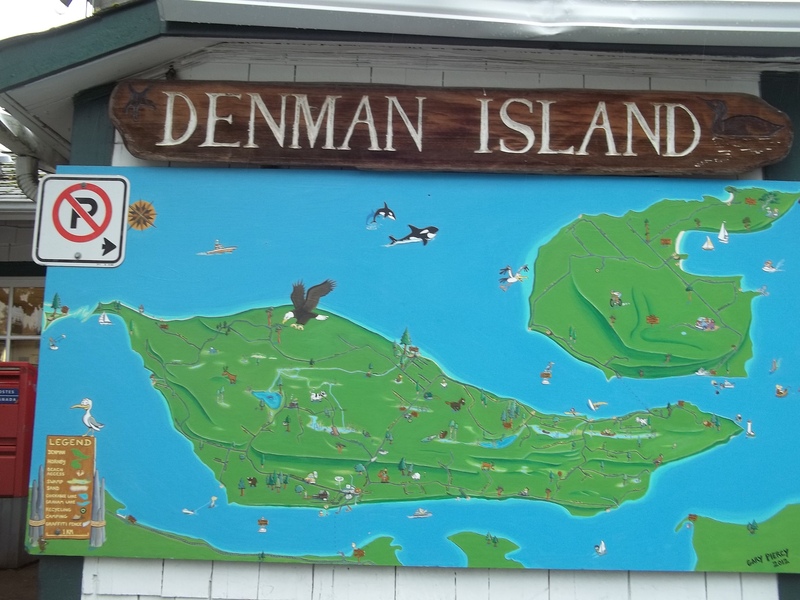 Then we took the short ferry ride back to Denman Island. We drove ‘the scenic route’ on some unpaved interior roads through former logged areas that now had new growth forests. It reminded me of the shameful exploitation of this pristine island’s Coastal Douglas Fir habitat decades ago before the local citizens banned together to protect it. The view of Vancouver Island was amazing from this vantage point. We arrived back to my sister’s home weary but happy that we had visited SO many places and met a lot of lovely people in our travels. We were really lucky to have great weather all during our Vancouver Island tour.